DIE Jovis, videlicet, 9 die Junii. Conference about the Safety of the Kingdom reported. Conference to be had about the King's raising Men. Message to the H. C. for it. L. Spencer to be present at the Review of the Northamptonshire Militia. L. St. John versus Benyon. Committee to consider of the Propositions from the H. C.
Lord James Dowglas to transport Horses to France. Message from H. C. about L. Willoughby's and the E. of Warwick's Letters, etc. Vote about the Deputy Lieutenants of Lincoln. 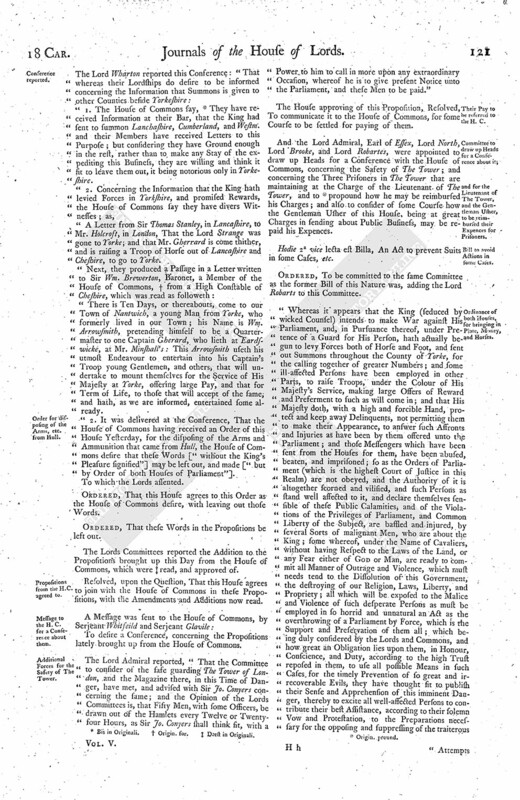 Report about the Propositions from the H. C.
Message from the H. C. for the Earl of Lindsey to be apprehended by the Militia, and sent up. Extract of a Letter from Lincoln about him. Order for the Militia to apprehend him, and send him up. Message from the H. C. for a further Conference. Order for disposing of the Arms, etc. from Hull. Propositions from the H. C. agreed to. Additional Forces for the Safety of The Tower. Their Pay to be referred to the H. C.
and for the Lieutenant of The Tower, and the Gentleman Usher, to be reimbursed their Expences for Prisoners. Bill to avoid Actions in some Cases. Ordinance of both Houses, for bringing in Plate, Money, and Horses. Finch and Hassall sent for, about a Proclamation published in the City about the Militia. Message from the H. C. for a Conference about raising Horse and Money. Order for attaching Justice Foster to be vacated. Conference about raising Horse and Money reported. "1. That Sir. Jo. Evelyn made a short Introduction. "The Affront of both Houses, and the Members, your Lordships have such a Sense of, think it would be an Injury to report them; it shall (fn. 1) suffice only to say this, That this Parliament hath suffered more than ever was offered to our Ancestors, or any Parliament before this." 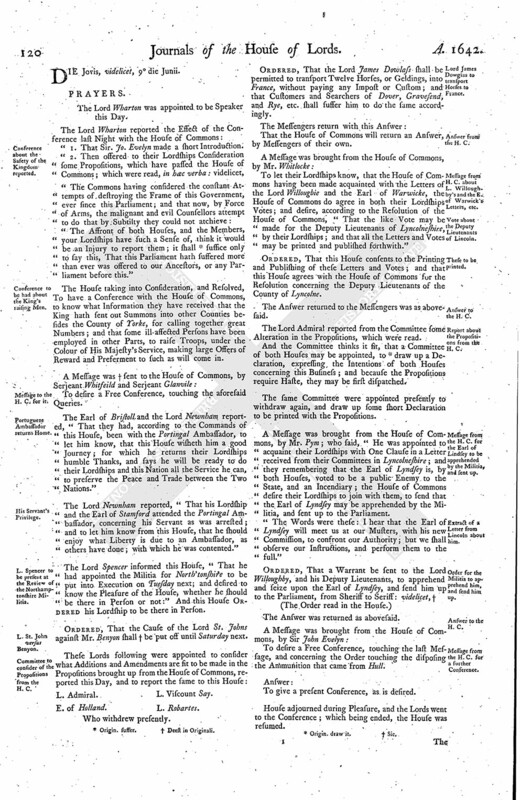 The House taking into Consideration, and Resolved, To have a Conference with the House of Commons, to know what Information they have received that the King hath sent out Summons into other Counties besides the County of Yorke, for calling together great Numbers; and that some ill-affected Persons have been employed in other Parts, to raise Troops, under the Colour of His Majesty's Service, making large Offers of Reward and Preferment to such as will come in. To desire a Free Conference, touching the aforesaid Queries. The Earl of Bristoll and the Lord Newnham reported, "That they had, according to the Commands of this House, been with the Portingal Ambassador, to let him know, that this House wisheth him a good Journey; for which he returns their Lordships humble Thanks, and says he will be ready to do their Lordships and this Nation all the Service he can, to preserve the Peace and Trade between the Two Nations." The Lord Newnham reported, "That his Lordship and the Earl of Stamford attended the Portingal Ambassador, concerning his Servant as was arrested; and to let him know from this House, that he should enjoy what Liberty is due to an Ambassador, as others have done; with which he was contented." The Lord Spencer informed this House, "That he had appointed the Militia for North'tonshire to be put into Execution on Tuesday next; and desired to know the Pleasure of the House, whether he should be there in Person or not:" And this House Ordered his Lordship to be there in Person. Ordered, That the Cause of the Lord St. Johns against Mr. Benyon shall † be put off until Saturday next. E. of Holland. L. Viscount Say. Ordered, That the Lord James Dowlass shall be permitted to transport Twelve Horses, or Geldings, into France, without paying any Impost or Custom; and that Customers and Searchers of Dover, Gravesend, and Rye, etc. shall suffer him to do the same accordingly. That the House of Commons will return an Answer, by Messengers of their own. To let their Lordships know, that the House of Commons having been made acquainted with the Letters of the Lord Willougbie and the Earl of Warwicke, the House of Commons do agree in both their Lordships Votes; and desire, according to the Resolution of the House of Commons, "That the like Vote may be made for the Deputy Lieutenants of Lyncolneshire, by their Lordships; and that all the Letters and Votes may be printed and published forthwith." Ordered, That this House consents to the Printing and Publishing of these Letters and Votes; and that this House agrees with the House of Commons for the Resolution concerning the Deputy Lieutenants of the County of Lyncolne. The Answer returned to the Messengers was as abovesaid. The Lord Admiral reported from the Committee some Alteration in the Propositions, which were read. And the Committee thinks it fit, that a Committee of both Houses may be appointed, to (fn. 3) draw up a Declaration, expressing the Intentions of both Houses concerning this Business; and because the Propositions require Haste, they may be first dispatched. The same Committee were appointed presently to withdraw again, and draw up some short Declaration to be printed with the Propositions. A Message was brought from the House of Commons, by Mr. Pym; who said, "He was appointed to acquaint their Lordships with One Clause in a Letter received from their Committees in Lyncolneshire; and they remembering that the Earl of Lyndsey is, by both Houses, voted to be a public Enemy to the State, and an Incendiary; the House of Commons desire their Lordships to join with them, to send that the Earl of Lyndsey may be apprehended by the Militia, and sent up to the Parliament. "The Words were these: I hear that the Earl of Lyndsey will meet us at our Musters, with his new Commission, to confront our Authority; but we shall observe our Instructions, and perform them to the full." To desire a Free Conference, touching the last Message, and concerning the Order touching the disposing the Ammunition that came from Hull. To give a present Conference, as is desired. "1. The House of Commons say, (fn. 5) They have received Information at their Bar, that the King had sent to summon Lanchashire, Cumberland, and Westm. and their Members have received Letters to this Purpose; but considering they have Ground enough in the rest, rather than to make any Stay of the expediting this Business, they are willing and think it fit to leave them out, it being notorious only in Yorkeshire. "A Letter from Sir Thomas Stanley, in Lancashire, to Mr. Holcroft, in London, That the Lord Strange was gone to Yorke; and that Mr. Gherrard is come thither, and is raising a Troop of Horse out of Lancashire and Cheshire, to go to Yorke. "There is Ten Days, or thereabouts, come to our Town of Nantwich, a young Man from Yorke, who formerly lived in our Town; his Name is Wm. Arrowsmith, pretending himself to be a Quartermaster to one Captain Gherard, who lieth at Eardswicke, at Mr. Minshall's: This Arrowsmith useth his utmost Endeavour to entertain into his Captain's Troop young Gentlemen, and others, that will undertake to mount themselves for the Service of His Majesty at Yorke, offering large Pay, and that for Term of Life, to those that will accept of the same, and hath, as we are informed, entertained some already. "2. It was delivered at the Conference, That the House of Commons having received an Order of this House Yesterday, for the disposing of the Arms and Ammunition that came from Hull, the House of Commons desire that these Words ["without the King's Pleasure signified"] may be left out, and made ["but by Order of both Houses of Parliament"]. To which the Lords assented. Ordered, That this House agrees to this Order as the House of Commons desire, with leaving out those Words. Ordered, That these Words in the Propositions be left out. The Lords Committees reported the Addition to the Propositions brought up this Day from the House of Commons, which were (fn. 7) read, and approved of. Resolved, upon the Question, That this House agrees to join with the House of Commons in these Propositions, with the Amendments and Additions now read. To desire a Conference, concerning the Propositions lately brought up from the House of Commons. The Lord Admiral reported, "That the Committee to consider of the safe guarding The Tower of London, and the Magazine there, in this Time of Danger, have met, and advised with Sir Jo. Conyers concerning the same; and the Opinion of the Lords Committees is, that Fifty Men, with some Officers, be drawn out of the Hamlets every Twelve or Twentyfour Hours, as Sir Jo. Conyers shall think fit, with a Power to him to call in more upon any extraordinary Occasion, whereof he is to give present Notice unto the Parliament, and these Men to be paid." The House approving of this Proposition, Resolved, To communicate it to the House of Commons, for some Course to be settled for paying of them. And the Lord Admiral, Earl of Essex, Lord North, Lord Brooke, and Lord Robartes, were appointed to draw up Heads for a Conference with the House of Commons, concerning the Safety of The Tower; and concerning the Three Prisoners in The Tower that are maintaining at the Charge of the Lieutenant of The Tower, and to (fn. 8) propound how he may be reimbursed his Charges; and also to consider of some Course how the Gentleman Usher of this House, being at great Charges in sending about Public Business, may be repaid his Expences. Hodie 2a vice lecta est Billa, An Act to prevent Suits in some Cases, etc. Ordered, To be committed to the same Committee as the former Bill of this Nature was, adding the Lord Robarts to this Committee. "1. They, the said Lords and Commons, do Declare, That whosoever shall bring in any Proportion of ready Money, or Plate, or shall underwrite to furnish and maintain any Number of Horse, Horsemen, and Arms, for the Preservation of the Public Peace, and for the Defence of the King and both Houses of Parliament from Force and Violence, and to uphold the Power and Privileges of Parliament, according to His Protestation; it shall be held a good and acceptable Service to the Commonwealth, and a Testimony of his good Affection to the Protestant Religion, the Laws, Liberties, and Peace of this Kingdom, and to the Parliament and Privileges thereof. "And because a considerable Aid cannot be raised by few Hands, and the Condition of all Men's Estates and Occasions is not always proportionable to their Affection, the Lords and Commons do Declare, That no Man's Affection shall be measured according to the Proportion of his Offer, so that he express his Good-will to this Service in any Proportion whatsoever. "2. And it is further Declared, by the Lords and Commons in Parliament, That whosoever shall bring in any Money or Plate, or shall furnish and maintain any Horse, Horsemen, and Arms, for the Purposes aforesaid, shall have their Money re-paid, with the Interest according to Eight Pounds per Cent. and the full Value of their Plate, with Consideration for the Fashion, not exceeding One Shilling per Ounce, and shall have full Recompence for all their Charge in finding, furnishing, and maintaining of Horse, Horsemen, and Arms; and for this both Houses of Parliament do engage the Public Faith. "3. And it is Ordained, That Sir John Wallaston, Knight and Alderman, Alderman Towes, Alderman Warner, and Alderman Andrewes, shall be Treasurers, to receive all such Money and Plate as shall be brought in, for the Purposes aforesaid; and that the Acquittances of them, or any Two of them, for the Receipt of the same, shall be a sufficient Ground for the Party so lending Money or Plate to demand the same again, with the Interest, and likewise Consideration for the Fashion of the Plate. "4. It is Ordered, That shall be Commissaries, to value the Horse and Arms that shall be furnished for this Service; and that a Signification, under the Hands of them, or any Two of them, of such Value of the Horse and Arms, and of the Time when they were first brought in, shall be a Warrant to demand Satisfaction, according to the said Values; and they shall keep an Account of the Time from the first Inrollment of any such Horse and Horsemen, that such as find and maintain them may be re-paid, according to the Rate of Two Shillings and Six Pence per Diem, for so long Time as they have maintained them in this Service; and the Commissaries are to attend at Guildhall, for the receiving and inrolling of such Numbers of Horse as shall be brought in. "5. 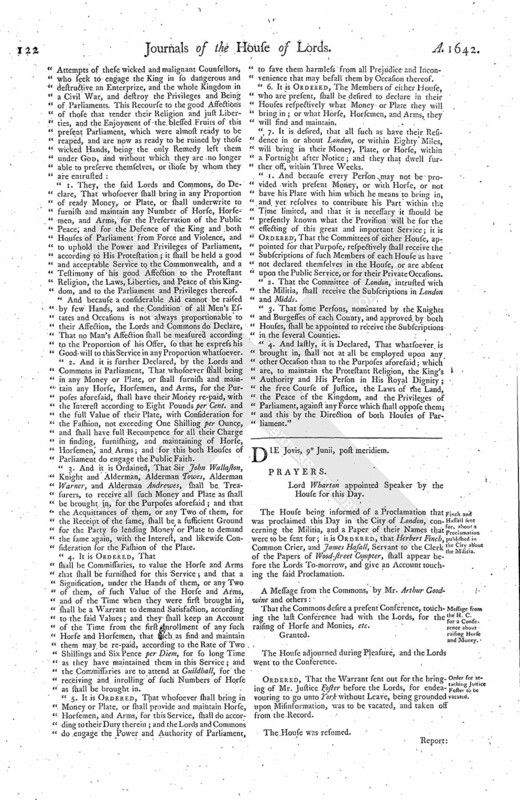 It is Ordered, That whosoever shall bring in Money or Plate, or shall provide and maintain Horse, Horsemen, and Arms, for this Service, shall do according to their Duty therein; and the Lords and Commons do engage the Power and Authority of Parliament, to save them harmless from all Prejudice and Inconvenience that may befall them by Occasion thereof. "6. It is Ordered, The Members of either House, who are present, shall be desired to declare in their Houses respectively what Money or Plate they will bring in; or what Horse, Horsemen, and Arms, they will find and maintain. "7. It is desired, that all such as have their Residence in or about London, or within Eighty Miles, will bring in their Money, Plate, or Horse, within a Fortnight after Notice; and they that dwell further off, within Three Weeks. "1. And because every Person may not be provided with present Money, or with Horse, or not have his Plate with him which he means to bring in, and yet resolves to contribute his Part within the Time limited, and that it is necessary it should be presently known what the Provision will be for the effecting of this great and important Service; it is Ordered, That the Committees of either House, appointed for that Purpose, respectively shall receive the Subscriptions of such Members of each House as have not declared themselves in the House, or are absent upon the Public Service, or for their Private Occasions. "2. That the Committee of London, intrusted with the Militia, shall receive the Subscriptions in London and Midds. "3. That some Persons, nominated by the Knights and Burgesses of each County, and approved by both Houses, shall be appointed to receive the Subscriptions in the several Counties. "4. And lastly, it is Declared, That whatsoever is brought in, shall not at all be employed upon any other Occasion than to the Purposes aforesaid; which are, to maintain the Protestant Religion, the King's Authority and His Person in His Royal Dignity; the free Course of Justice, the Laws of the Land, the Peace of the Kingdom, and the Privileges of Parliament, against any Force which shall oppose them; and this by the Direction of both Houses of Parliament." Lord Wharton appointed Speaker by the House for this Day. 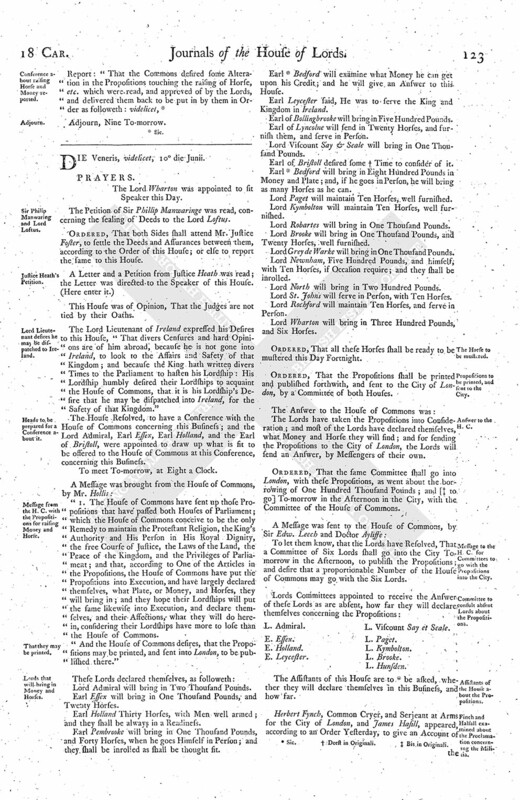 The House being informed of a Proclamation that was proclaimed this Day in the City of London, concerning the Militia, and a Paper of their Names that were to be sent for; it is Ordered, that Herbert Finch, Common Crier, and James Hasall, Servant to the Clerk of the Papers of Wood-street Compter, shall appear before the Lords To-morrow, and give an Account touching the said Proclamation. That the Commons desire a present Conference, touching the last Conference had with the Lords, for the raising of Horse and Monies, etc. The House adjourned during Pleasure, and the Lords went to the Conference. Ordered, That the Warrant sent out for the bringing of Mr. Justice Foster before the Lords, for endeavouring to go unto York without Leave, being grounded upon Misinformation, was to be vacated, and taken off from the Record.